Cuemaster (formerly Image-Ination) has more than 15 years of experience in renting and operating teleprompter systems. 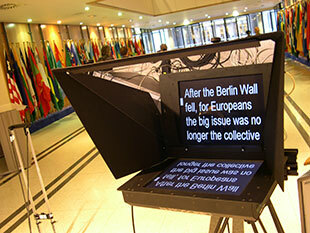 We own the most extensive range of teleprompter equipment available for rent in Belgium. We have both the on-camera units (from 8″ to 19″) as well the conference sets (manual and motorized stands) used for speakers to address a live audience. We only use the proven and award winning Autoscript equipment so you can be sure of a stress less production. Our operators have broad experience and speak fluently at least 3 languages (Dutch, French, English, German and Spanish). Contact us if you have any question about how to use a system and which solution we can find to satisfy your speakers.